Today's southern hemisphere fauna and flora are renowned for their transantartic relaionships, dating back to the break up of Gondwanaland by the end of the Jurassic period, some 150 million years ago. Among Dipterists, the southern continents have long been known to provide the habitats for phylogenetically interesting Sciaroidea, an extremely diverse, cosmopolitan group of bibionomorph flies that includes the well known fungus gnats and gall midges. New Zealand is no exception in this respect, where two species, Heterotricha novaezealandiae and Ohakunea bicolor, were described as early as 1927 by A. L. Tonnoir and F. W. Edwards, and reamain unplaceable within the current family-level classification of the Sciaroidea. The enigmatic relationships of sciaroids like Heterotricha and Ohakunea are the main reason for the ongoing debate on the higher-level systematics within the superfamily. 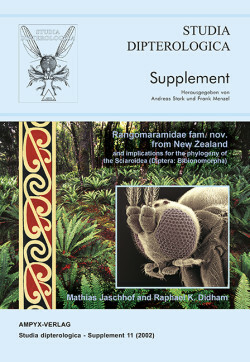 Given that New Zealand's fauna is of such extraordinary significance for understanding the evolution of the world's Sciaroidea, it comes as sonewhat of a surprise that the study by Tonnoir and Edwards has not inspired subsequent, intensive sciaroid research in this part of the world for the last 75 years. This may be partly explained by the worldwide decline in biosystematic expertize, but also partly because the completeness of Tonnoir and Edwards' work has apparently been overestimated. As shown in this paper, New Zealand's sciaroid fauna is far from exhaustively studied. By taking the full methodological advantage of modern, highly effective Malaise trapping, the authors have recently collected and studied a tremendously large and diverse set of samples of Sciaroidea from indigenous forests of New Zealand's main islands. This material, supplemented by collections of numerous New Zealand entomologists over the past 20 years, yielded five new species of sciaroid Diptera which are classified in a new family named Rangomaramidae. Adult morphology, biology and distribution of Rangomaramidae (*long-winged fungus gnats*) are described and illustrated by numerous line drawings as well as light and scanning electron microscopic images. The origin and evolution of Rangomaramidae are discussed in the contex of previous hypotheses on the phylogenetic relationships within Sciaroidea. Rangomaramidae appear to be a relict group of Sciaroidea, with a limited modern dustribution and a comparatively small number of extant species. The new taxa may shed more light on the relationship between fungus gnats and gall midges and on the unresolved question of the sister group of Cecidomyiidae.